Although not the actual focus of the game, there are powerups, such as this flying cap. Sometime in late 1996 I stepped into a local independent games shop and approached the counter, just when I was about to enquire about some Mega Drive game or other the shop owner (my future boss) directed me towards one of the three TV’s he had to the left of the counter. I was then passed a controller, a controller I had only seen in gaming magazines and in day dreams during some English or Maths class. Nothing could have prepared me for when on that fateful day he hit the switch. I had read a little bit about Nintendo’s new 64 bit power house, but mainly about the specs of this cutting edge console and controller combination. I had yet to see anything in the way of gaming. I felt how Charlie must have felt when he first saw the wonders of Willy Wonker’s chocolate factory. The game was in Japanese and I could only just about work out how to get started, but what I could see straightaway was that my faithful friend Mario was about to grab my undivided attention once again. 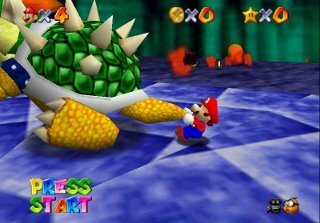 The Bowser Giant Swing was one of the moments of the game, and utilised the 64's unique controller. I’d played on the Sega Saturn and the Sony Playstation. I’d seen FMV (Full Motion Video) before and as the letter from peach came to an end, I had to say I was pretty disappointed by the attempt at FMV before me. I was also getting bored waiting for the game to start. Mario just stood there breathing, after a little while I leant forward on the Analogue stick and to my absolute shock Mario began to walk! It’s hard to imagine now with today’s High Definition graphics but at that particular moment in time I was absolutely blown away with the sheer power I held in my hands and for once the advertisement I would soon see everywhere “The most powerful console on earth” was right. The gameplay starts with what is best described as a free-roaming training area with lush colours all around and an almost calm feel to the courtyard, moat and castle. I’d played for a long old time on the classic Mario games but this was something else. I could actually see the world’s favourite plumber in all his glory and with loads of moves and a camera that for once in a 3D game was actually pretty good. Getting to grips with Mario didn’t take long and I soon found the entrance to main game… through the entrance to the castle! Little did I know at the time there was a little more to do outside the castle once the game progressed. I’d then spent a little too long roaming around the castle being told in Japanese that I need more stars so I asked my helpful future boss. He told me to jump into a painting… jump into a painting?? What a crazy idea, but a crazy idea that worked! I was whisked away into my first level and with that whisked out of the shop by my mother. I had to wait a long time before I could bless my eyes and ears with the wonderful world of Mario in full blown 3D again, but a wait well worth it. The game consisted of multiple levels each with its own bit of Nintendo magic, anyone up for racing a penguin? Being shot from cannon? Flying around beautiful 3D environments? Catching an elusive golden bunny? It pretty much had it all. The game had an excellent ability to make you keep coming back for more until you had all 120 stars and taken that cannon trip to see Yoshi. 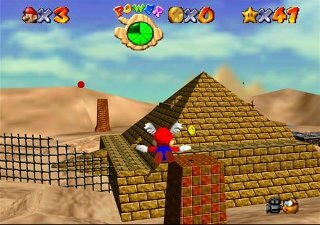 Level design was key to the success of this gamimg goodness .With a good difficulty curve and a great variety of levels which saw you jumping around on top of a mountain, flying around the desert, skidding on ice or trying not to end up with toasted backside from lava. Never before had there been such a perfect mix of platform and puzzle, few games even now a days can even come close to that blend. One of my favourite parts of the game was being let into a door with fewer stars than was needed only to find a never ending stairway that would only let you to the top once you had enough stars. Another nice touch of the game was the boss levels, these involved running circles around Bowser until you were able to get hold of his tail and spin him round using the analogue stick until he was airborne. Once he was flying around and around in circles it was up to you to time when to let go of his tail and hopefully sending him crashing off the edge or onto one of the bombs surrounding the arena. There aren’t that many games that age well and especially not ones in 3D. 2D has an ability to be almost timeless if done right, 3D is a totally different beast. Mario 64 to me looks as fresh today as it ever did and it might not be the flashiest title out there but it’s filled with good old Ninty magic and as most people know Ninty magic is timeless!